In late June, amid triple-digit temperatures, Palm Springs residents Ray and Cheryl Kelley celebrated Christmas - with snow. This month, the entire nation can share in their experience by tuning in to A Holiday Celebration at Ford's Theatre, airing on ABC. The taping of the show in June involved machine-generated snow, holiday decorations, folks dressed in winter attire, and the Secret Service. Atten-dees included the President and First Lady, as well as members of the Senate and Congress. "It was a career highlight for me to perform before such a distinguished audience," says Ray Kelley, who has played cello in recording sessions for Neil Diamond, Paul McCartney, and Barbra Streisand. 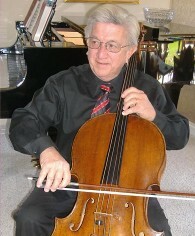 As first cello in the orchestra, Kelley also performed a solo with Olivia Newton-John. But Kelley's heart lies in Palm Springs, where he founded Resort Music, Inc. It began with a simple concept: Counting himself among musicians who play for movies and advertisements, he says, "All we do is work on things that promote everybody else. Why not a city?" So in 1988, he produced a CD titled The Palm Strings. He has since produced "destination" music for Chicago (Sears Tower has its own version), Wisconsin, Florida's Space Coast, and Marriott Casa Magna Mexican resorts. Cheryl Kelley - whom he has known for 31 years, worked with for 20 years, and been married to for 4 years - produces the souvenir liner notes with pictures, descriptions of attractions, and maps. Chicago remains the Kelleys' biggest customer. They continue to place orders, whether for retail sales or a gift item. Destination CDs are used in tourism promotions and gift bags. "It's a reminder of where people were when they heard [the music]," Cheryl says. In fact, more than 100 titles of the all-instrumental music can be heard in background music systems on five continents. Most of the songs are original pieces, though a couple of standards could hardly be overlooked, i.e., Chicago/My Kind of Town and On Wisconsin. "The whole idea was to promote Palm Springs internation-ally," Ray says, noting that when he is interviewed on radio and television, he talks about Palm Springs "and how it all started." His musician friends have told him, "You're a really good cello player, but you really should be a lobbyist."